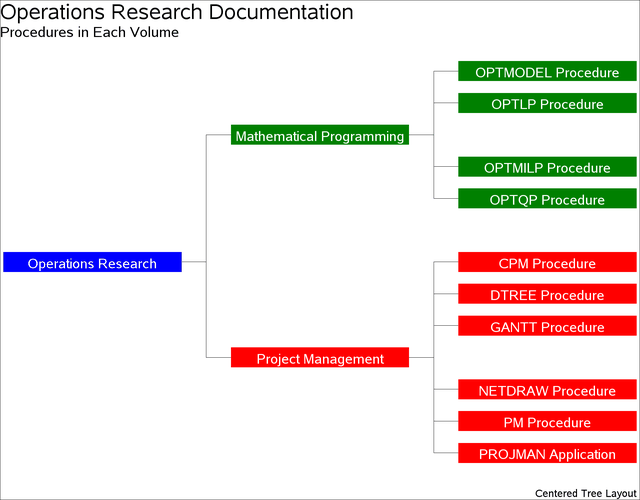 This example illustrates using the TREE option to draw organizational charts. 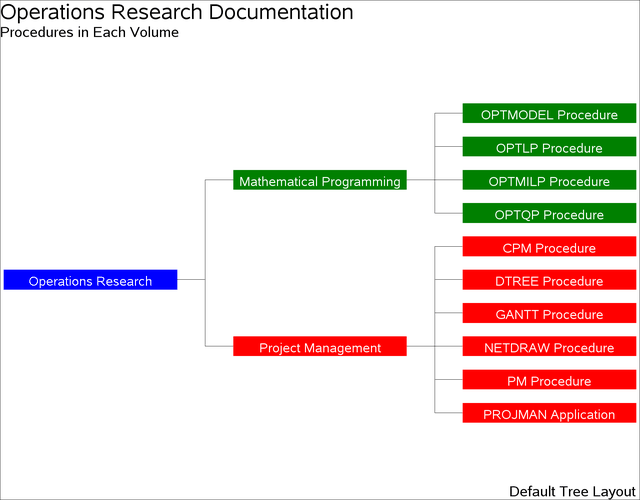 The Network data set, DOCUMENT, describes how the procedures are distributed between two volumes of the SAS/OR documentation. The structure can be visualized easily in a tree diagram. The data set DOCUMENT contains the parent-child relationship for each node of the diagram. For each node, a detailed description is contained in the variable ID. In addition, the variable _pattern specifies the pattern to be used for each node. PROC NETDRAW is invoked with the TREE option, which illustrates the organization of the documentation in the form of a tree diagram drawn from left to right. The CENTERID option centers text within each node. Arrowheads are not necessary for this diagram and are suppressed by specifying ARROWHEAD=0. Output 9.15.1 shows the resulting diagram. The procedure draws the tree compactly with the successors of each node being placed to the immediate right of the node, ordered from top to bottom in the order of occurrence in the Network data set. The next invocation of PROC NETDRAW illustrates the effect of the SEPARATESONS and CENTERSUBTREE options on the layout of the tree (see Output 9.15.2).